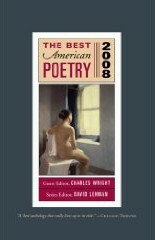 The Best American Poetry 2008, Guest Editor Charles Wright, Series Editor David Lehman. The Best American Poetry 2008. Robert Bly, Jorie Graham, Louise Glück, W.S. Merwin, Franz Wright. Frank Bidart, Carolyn Forché, Frederick Seidel, Patti Smith, Kevin Young. emerging poets like Joshua Beckman, Erica Dawson, and Alex Lemon. Selected Charles Wright as the 2008 guest editor. For the 2006 issue, it was the 1940s. For the 2007 issue (guest editor McHugh) it vaulted forward three decades to the 1970s. of birth. 2008 issue. 2007 issue. 2006 issue. 1995 issue. Robert Bly's "[Language exists because]"
Carolyn Forché's "The Museum of Stone"
Maxine Kumin's "Though He Tarry"
Philip Levine's "Of Love and Other Disasters"
Franz Wright's "Passing Scenes (While Reading Basho)"
Lynn Xu's "[Language exists because]"
the same number as for The Best American Poetry: 2007.
a smaller variety (14% less) than the 52 in The Best American Poetry: 2006.
a still smaller variety (25% less) than the 60 in The Best American Poetry: 2005. Books of Poetry Form. Alphabetic list of poetry forms, etc. Poetry Home. How to Write Poetry. Copyright © 2008-2015 by J. Zimmerman, except for quotations.